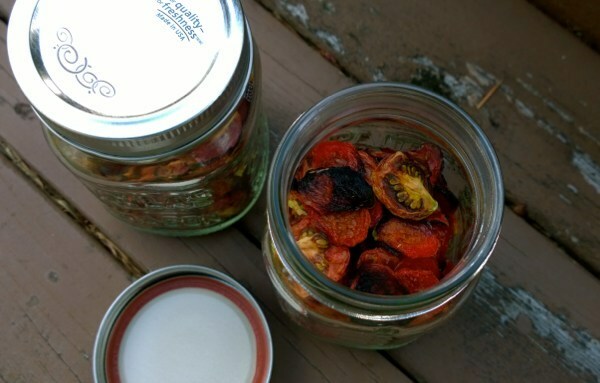 Sun-Dried Tomatoes are an easy way to preserve a lot of tomatoes, quickly. And enjoy them all year long. Which is especially nice if you have multiple plants dripping in ripe tomatoes in late summer. While drying the tomatoes on a dehydrator isn’t “sun-dried”, it gives the same effect, with little effort. Wash, dry off and pop off the stems. Slice your tomatoes in half, and place on dehydrator trays. If you have mesh liners, that is best. When placing on the trays, try to keep similar sizes together. Dry at 135 to 145°. Check after 6 hours and wiggle them up if you can, without tearing. Flip over to speed up drying. Humidity and size of tomatoes will determine how long it takes, as will your dehydrator. My tomatoes took a full 24 hours, they were very juicy. As the smallest ones were done, I took those off and checked every hour, removing as needed. Let cool on mesh, then transfer to glass jars for storage. Shake every month to keep the residual moisture in check. Store for up to a year.